The company’s history began in 2011, when the first renal replacement therapy center was opened in Karaganda. Initially, the company’s strategy was to give patients the best possible service, including the quality of dialysis treatments, completeness and comprehensiveness of the approach. That is why LLP «B.B.NURA» chose renowned worldwide leader B.Braun Avitum as its strategic partner in the field of dialysis machines and consumables. Herco water purification system was selected for the best quality of services and patient safety. To complete the services of the best possible service for the maintenance of equipment and buildings was provided initially stated standards for food service and patient transport service for patients. Clinical partners of the company became the leading nephrology and efferentology specialists in the regions. All supplies, medicines and diagnostic services were provided in accordance with the approved legislation of the Republic of Kazakhstan in the field of standardization of dialysis services and have appropriate certification. Focusing on quality and service have enabled the company in 2012 to receive the state order for the provision of dialysis services. 2013 In 2013 there was a breakthrough in the provision of services, the geography of the company’s dialysis centers: there were outpatient dialysis centers in the cities of Pavlodar, Aksu, Ust Kamenogorsk. In the same year there was a significant event – efferentology office was opened on the basis of the republican center – JSC “National Scientific Center of Oncology and Transplantation” in Astana. In this division, in addition to outpatient dialysis became possible medical care for patients with acute renal failure in severe conditions: cancer and hematological pathologies, patients post-natal period. Since then, the company began to provide services to renal replacement therapy in patients with acute renal failure in different regions of the country. With the help of air ambulance specialists LLP «B.B.NURA» started implementing trips to remote regions of the country. The company actively worked on creating a comprehensive approach to patients, vascular profile experts were taken. Work has begun on the formation of vascular access: fistula and installation of permanent catheters. In 2013, the expanded range of services in addition to outpatient and inpatient hemodialysis, the company began to provide services to the population of peritoneal dialysis, plasmasorption, online hemodiafiltration, From the same period, the company implemented an electronic patient monitoring system. 2014 In 2014, outpatient dialysis centers group complemented new clinics opened in Semey and Kyzylorda. Despite the unfavorable ecological background regions, as water purification services led to quality indicators, the appropriate standards since 2014 the clinic began to actively cooperate with the transplant center, preparing patients for the decisive moment in their lives – kidney transplantation. All patients who are served by the company are in the register of potential recipients of renal transplantation. 2015 In 2015, was opened own, inpatient department in Astana on the basis of a multidisciplinary clinic. Resource stationary clock assistance allowed to provide medical care to patients from all branches of the company. In September 2015 it is planned to open the first model of nephrology centre, which will provide a full range of services to patients from outpatient to inpatient care with elements of preparation of patients for kidney transplantation. Since 2015 the company adopted the concept of development and policy on quality management. Was created a clinical department with the external auditors and mentors. Clinical audit is conducted on an ongoing basis. Differentiated approach to the payment of specialists has allowed to achieve motivation on the quality of service. Set goals for obtaining international accreditation JCI. One of the main aspects of the company was to focus on the principle of human resources: the quality of services for patients and focus on improving the quality of staff with continuing education methods. 2016 In 2016, Nephrology Center was built and put into operationin Pavlodar. This medical center provides a complete nephrological cycle of treatment from diagnosis of kidney diseases to transfer to transplantation, as well as post-transplantation care of patients. It was in our Nephrological Center on March 16 that the famous joke of the President of the Republic of Kazakhstan was made: “… the doctors are divided into three categories: the first category is” from God “, the second one is” well, with God “and the third category is” God forbid “.Model for construction of Nephrology Centers was approved by company within the framework of PPP lawand draft memorandums for the construction of similar nephrological centers were sent to the Public Health Department of Kyzylorda and South Kazakhstan oblasts.In 2016, a professional with international experience in managing dialysis clinics Dr. M. FatihErgeser was invited to the position of the company’s general manager. The company has improved quality of hemodialysis’procedure, quality of staff’s work, thus the company is coming closer to international quality standards. The company’s management is implementing measures aimed at developing medical personnel, our doctors took an active part as lecturers at the IV International Kazakh-Turkish Nephrological Congress and attended annual international conference ERA-EDTA. On a regular basis, advanced training of medium level medical staff is carried out according to the corporate educational programs.Desire to cover the need for medical care for remote regions of the country is one of the main principles of the network of dialysis clinics “B.B. NURA”. To that effect, a center opened in the city of Kokshetauin Akmola regional hospital. This center accepts patients from all surrounding areas of Akmola region (Shchuchinsky, Zerendinsky, Atbasarsky, Zharkainsky, etc. ).The center is open in the most densely populated region of our country, in Shymkent. Patients of the South Kazakhstan region were enormously happy to host the opening of “B.B. 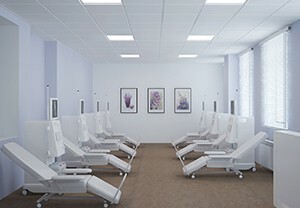 NURA”dialysis center!